These flags are being thrown often and at critical times in football games, including week one of the NFL season. 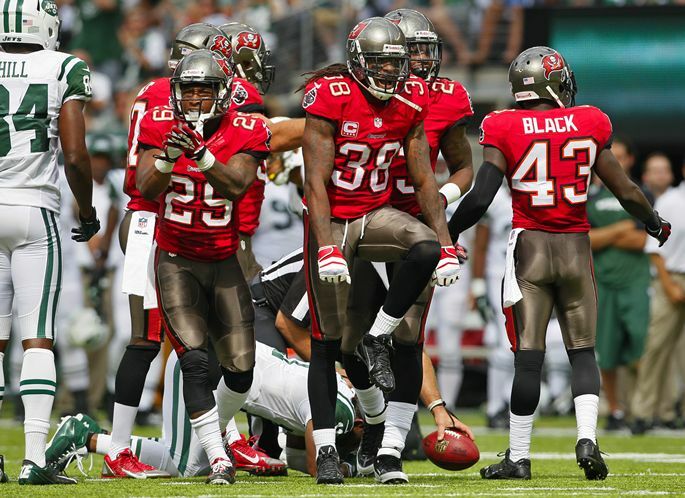 Tampa Bay Buccaneers’ CB Dashon Goldson was flagged and fined for a hit on the New York Jets receiver Jeff Cumberland in the 2nd quarter of Sunday’s game. The hit sent Cumberland to the locker room for a mandatory concussion evaluation, but he returned in the 4th quarter. The issue most NFL fans have is that Goldson clearly lowered his shoulder and struck the chest of Cumberland. The impact did appear to force Cumberland’s head downward, striking Goldson’s helmet and the flag was thrown. A critical penalty, which was equally as controversial, unless you’re a Jets fan, was Bucs’ safety Mark Barron’s hit on Jet Jeremy Kerley. 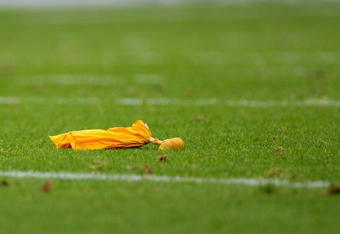 An unnecessary roughness flag was thrown on 3rd and 21 to go as QB Geno Smith tossed a pass over the middle to Kerley. 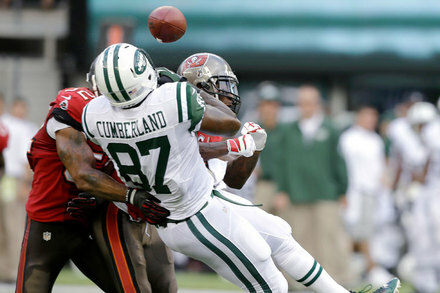 Two Buccaneers closed on Kerley and Barron arrived to finish the tackle. Barron was flagged for a hit on a defenseless player. An interview with Barron with the Tampa Bay Times had Barron saying, “I hate that it happened, and I’m going to hate to see the letter (from the league) that comes with it, but that’s just me playing ball, and that’s the only way I know how to play,” Barron said. “It’s hard. You’re running at a guy and this guy starts to fall and you’re already taking off and aiming where you want to go and he falls and the target changes.” The blow to Kerley knocked his helmet off and sent him to the locker room with Cumberland to be evaluated for a concussion. Kerley returned to the game, but was held out of practice Monday for a concussion. The flags on Goldson and Barron were overshadowed by the final 15-yard penalty on Lavonte David, who shoved the Jets QB out-of-bounds and was flagged for the third personal foul in the game. More importantly, the penalty moved the Jets into field goal range with seven seconds remaining for Nick Foles who drilled a 48-yard field goal to put the Jets in the win column. The NFL has been very vocal about the concern for concussions occurring in the league and the officials protecting players that they consider defenseless. While defenders are still trying to adjust and get acclimated to the new rules, offensive coordinators around the league are making the necessary adjustments to manipulate the new focus of officials to their advantage. Wide receivers are now going over the middle for a risk/ reward of either making a catch against a hesitant defender or take a hit and watch the yellow flags fly. There were 15 wide receivers on opening week that had 100+ receiving performances, including a 208 yard total by new 49er Anquan Boldin. Comparing that total to last season, in week one there were only ten receivers with 100+ yards and Reggie Wayne led the group with a 135-yard outing. Combine that with the lack of 100-yard rushers in week one there seems to be a significant shift to the middle of the field to take advantage of the new rules. Last season, there were an average of seven rushers a week that eclipsed the 100-yard mark. In week one, two rushers, LeSean McCoy (184 yards) and Shane Vereen (101 yards) eclipsed the mark. For wide receivers, only one averaged 100+ yards in 2012, which was Detroit’s Calvin Johnson (122.8 receiving yards per game). In 2013, it appears there could be as many a five. So the question has to be raised, is this new safety focus good for the game of football? Football fans around the world chimed in on blogs and online articles. The majority are not in favor of the new rules and believe defenses are being unfairly softened in the name of protecting the athlete. Football has always been a violent game. 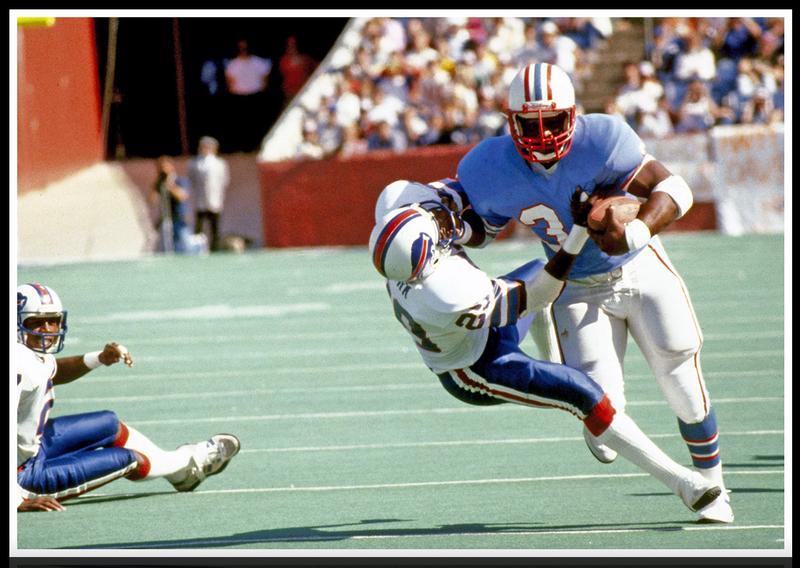 Is the NFL diminishing the value of the sport to the detriment of the fans who love to hear the crack of the pads? For the opening game between the Ravens and the Broncos on Thursday, the viewership was up 5% over last year’s game, according to NBC Sports. As the season goes on and the personal fouls increase on seemingly routine strikes on wide receivers, it will be worth watching the viewership numbers to see if the drop due to frustrated fans who want to see their “old” football back.